Our company is called SERVICIO DE TRANSMISIONES FLORALES, S.L.U. - "TELEFLORA", with more than 50 years of service experience dedicated to floral services in Spain. Our origins date back to 1958, an era in which the small company "HELIOS" was in charge of the floral transmission service in Spain, with its central office in Madrid and with a service which extended only to a reduced number of areas. Approaching 1966, the aforementioned company disappeared, changing its trade name to TELEFLORA. It is from this moment onwards when, slowly but surely, we began to initiate a pattern of continuous progress with regards to the number of associated florist´s; something which has allowed us to achieve an extremely important share of the market, as well as situating the company in the position which it occupies at present. We are exclusive Spanish member of TELEFLOR INTERNATIONAL, which has over 60000 affiliated florists outside Spain and is established in the majority of countries in the world. We are fully convinced of the need to mantain an excellent public image of the company and one which reflects our philosophy of serving our customers. This extensive national and international network, coupled to the expertise and commitment of our florists, means you are in the best hands. When you buy on teleflora.es, your order is sent to one of our 1800 artisan florists located across Spain. Then, Stunning fresh flowers are handcrafted by our local florist and personally delivered. 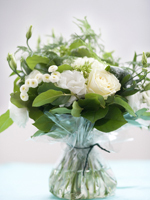 Our florist will arrange a delivery attempt with the recipient of your order. We will try that the bouquet you ordered is as similar as possible to the one you receive. However, be aware that varieties, colors and container may vary due to local availability.